You don’t want to miss this—mark your calendars! Join us in Napa, California for a five day training event March 18–22, 2019. Jason Yoder, our PowerShell expert, will provide in-depth training Monday – Friday starting at 9:00 a.m. each day. HURRY! We only have 20 spots available. From now until December 31st, 2018, our early registration fee is only $375.00. The fee includes the training course and lunch Monday – Friday. What a great deal! After December 31, 2018, the registration fee will be $500.00. To purchase your ticket or for more information, contact SAPIEN Technologies, Inc. today. PLEASE NOTE: If we do not meet the minimum required number of registrants by January 31, 2019, we will not be able to proceed with the class. Under those circumstances, all registration fees will be refunded the same way they were paid. Discuss concepts, watch the concepts in action, and utilize each concept in a lab environment or as a class exercise. This chapter focuses on getting the class set up in the test environment. 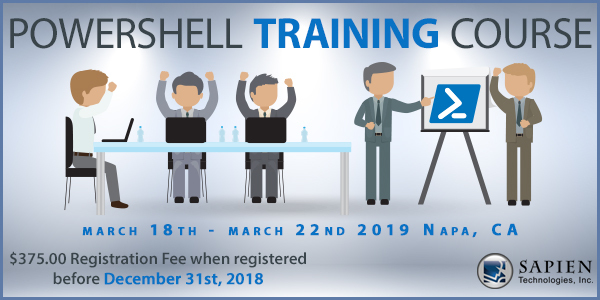 Then we will discover the different features of PowerShell on various operating systems and PowerShell versions to help the participants understand what they can do with PowerShell in their respective environments. PowerShell is built for automation. However, mistakes happen. This lesson focuses on making mistakes, preventing them, and how to quickly recover from them. We will learn how to ask for and receive help from PowerShell, and we will also see how to find what PowerShell commands are available for specific technologies such as Exchange and SharePoint (note, we will not be working with Exchange or SharePoint). The PowerShell pipeline provides an environment that significantly reduces the need for coding. We will learn how the pipeline works by first learning about a concept called objects. Once we know how to work with objects, we will utilize the PowerShell pipeline to achieve our goals quickly. Using a real-world example of a virus infection, we will utilize common skills and knowledge to hunt down a virus using PowerShell Providers. This will allow IT Professionals to modify the registry on nodes across an entire network. All PowerShell cmdlets pull their information from the Windows Management Instrumentation or Common Information Model library. We will learn how to do the same and pull detailed information from all of our nodes that is not available in the PowerShell cmdlets. This will allow us to create powerful custom tools for our environments. IT Networks can range from a few machines to hundreds of thousands of nodes. In this module, we will look at how to utilize PowerShell remoting to effectively execute commands on hundreds of nodes at the same time. We will also look at security and Just Enough Administration. In this session, we examine PowerShell’s ability to use background and scheduled jobs to perform many tasks on different nodes at the same time. This will allow IT Professionals to execute the same code at the same time on multiple nodes. How we store our data is important. In this session, we explore a variety of ways to store both simple and complex data, and we will also learn how to build customized objects. This hands-on exercise with the instructor will take attendees through the basics of script development. We will also build a PowerShell cmdlet and a fully autoloading PowerShell module. In this session, we look at developing code to quantify your time savings with PowerShell, and we also introduce SAPIEN’s PowerShell Studio. We will look at some of the advanced features of PowerShell Studio that can help us with our coding, and we will also build a graphical front end for our PowerShell code. This session focuses on the world of Desired State Configuration (DSC) and ways to apply it to configure our nodes. We will configure some of our servers with DSC, and watch how DSC can prevent a drift in our configurations.